All content on eDirectory would be filtered by the user's location using geo-targeting. Geo-targeting your eDirectory site will provide your site visitors with content specific to their current location (ex: New York City listings will display for site visitors searching from New York City; San Francisco listings will display for site visitors searching from San Francisco). 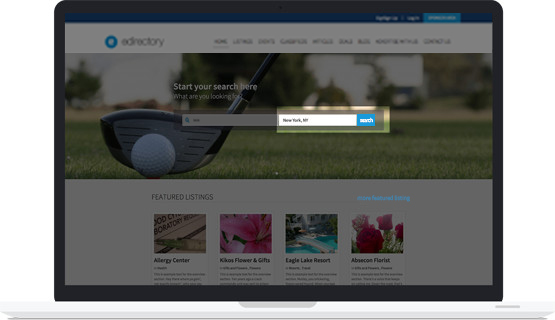 Empower your directory site’s listing owners and sponsors with the ability to reach highly targeted audiences through their site content. Increase click-through rates and ROI by only showing relevant content to your directory’s visitors. When visitors of the eDirectory-based website open the Homepage, the content will be automatically filtered to display targeted information from the site visitor’s current location. The location data would be determined by the GEO-IP data provided by the Internet Service Provider. Each module’s Homepage (Listings, Events, and Classifieds) will be filtered by location in the same manner. In addition, when a site visitor conducts a search, the results will be ordered by distance from the site visitor’s location. * this module uses HTML5 services, and some browsers like Chrome 50 now requires an SSL certificate. So, acquiring an SSL certificate for your domain may be necessary to work for all browsers.